Students will learn about Spanish modern artist Joan Miro by being introduced to his art, and then by creating their own masterpiece after his work. This free lesson plan is designed to fulfill the National Standards for Art Education: Grades K-4/Standard 3: Choosing and evaluating a range of subject matter, symbols, and ideas; and Grades 5-8/Standard 2: Using knowledge of structures and functions. Tell students "Our project will be to create your own art masterpiece following these examples of Miro's art on a cookie." Tell students, "On your table you will find an Art Masterpiece Cookie Design Worksheet with three large circles and several crayons. Our first step is to draw a design for your cookie on this worksheet. Your design should use elements that we have seen in Miro's art." Provide each student with a sugar cookie, an icing bag with black frosting, a popsicle stick or clean paint brush, and access to the premixed colors of frosting. 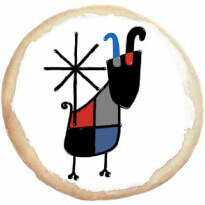 Tell students, "You may begin to paint your Miro cookie." Quiz students about Joan Miro as they paint. Students may enjoy learning about Joan Miro by printing a Miro Cookie Worksheet, and recreating the cookie featured in this lesson.